Park on the left-hand side of the road if possible, and always park on the left at night. Do not park opposite or within 10 metres (32 feet) of a junction, except in an authorised parking space. In a car park, reverse into parking spaces if possible, as this is safer when driving out of a space. It's also more fuel efficient as you’ll be manoeuvring with a warm engine. Check your mirrors and over your shoulders frequently – you still need to know what’s going on around you. Don’t just rely on parking sensors to guide you. There may be a trolley or something left in the space you wish to park in. Always keep your eyes peeled. When looking for a parking place, don’t stop suddenly. 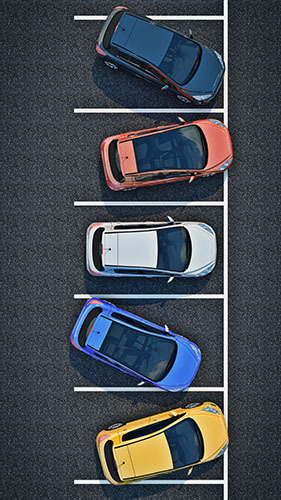 Drive slowly past a potential parking space and size it up to see if your car will fit. If you can’t stop because you have traffic behind you, drive on. When visiting a supermarket or retail park, try to park away from trolley parks and corners to avoid your car being exposed to damage from trolleys. When parking, open your window and turn off your stereo. You can often hear something before you can see it.